The controversy is centered in a concession run by PT Adindo Hutani Lestari (AHL) in North Kalimantan, Indonesia’s newest province, on the island of Borneo. According to Global Forest Watch, three quarters of the concession consists of degraded primary forest, much of which is classified as “deep peat” — peat swamp deeper than three meters. Data from Global Forest Watch shows that Adindo has dramatically scaled up forest clearing in recent months, after clearing some 5,000 hectares between 2011 and 2013. The dispute is over the timing of the clearance. APRIL set a May 15, 2015 cut off for ending deforestation. Global Forest Watch data for the Adindo Hutani Lestari (AHL) concession at the center of the controversy. Eyes on the Forest, a coalition of Indonesian environmental groups coordinated by WWF-Indonesia affiliates, alleges that Adindo continued to chop down peat forests after the May 15 cutoff date. Eyes on the Forest adds that the activity also violates APRIL’s 2014 commitment and a law barring conversion of deep peat. Global Forest Watch data suggests that some of the recent clearing breaches Indonesia’s Forest Moratorium. But APRIL told Mongabay that trees in the area in question were felled prior to May 15. Global Forest Watch images showing the concession area, including recent FORMA alerts. Click to enlarge. Nonetheless APRIL said it has asked PT. Hatfield Indonesia, a mapping consultant, to conduct further analysis of the points highlighted by Eyes on the Forest. It expects the analysis to be completed by the end of the month. The pulp and paper giant, which has been the target of campaigners for long-running conversion of peatlands and rainforests in Sumatra for industrial acacia plantations, reiterated that it remains committed to its policy. “We take this matter seriously and are working hard across our concession to implement the strengthened commitments announced in SFMP 2.0 on 3 June,” said APRIL. “The bottom line is that we have committed to halting the harvest of non-plantation supply and are accelerating towards our 1-for-1 plantation to conservation commitment. Landsat analysis released by Eyes on the Forest. The analysis shows forest loss in AHL’s concession between December 2013 and May 2014. The report says 290 hectares of high conservation value forest are identified within the red boundary. However despite APRIL’s reassurance, Eyes on the Forest maintains that since the beginning of last year AHL logged an area that had previously been categorized as having high conservation value, which the company previously committed to protect. “Our field investigation between 17 and 25 April 2014 discovered AHL to be still clearing natural forest, even a small High Conservation Value Forest identified by Tropenbos for protection, in its Sesayap Sector concession of 63,700 hectares,” stated Eyes on the Forest. It further noted the deep peat clearance. Clearing in the PT. Adindo Hutani Lestari (AHL) Sesayap Sector concession. Photo taken by GAPETA Borneo, an EoF partner, at 3°33’21.7948″N, 117°4’25.8401″E on 19 April 2014. Greenpeace, which suspended its campaign against APRIL earlier this month after the new forestry policy was released, also expressed concern about the situation. APRIL is Indonesia’s second largest pulp and paper producers after Asia Pulp & Paper (APP), which established a zero deforestation policy in 2013. 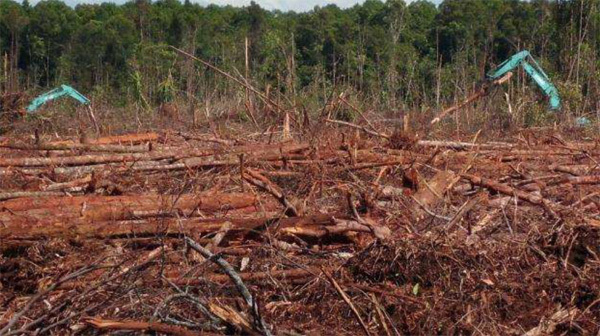 No Comments to "Controversy emerges over alleged deforestation policy breach by APRIL supplier"